Monty and Teri Reicks at Petersburg Building & Supply. 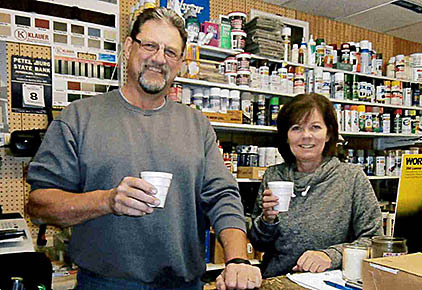 While still in their 20s, with a young family, Monty and Teri Reicks started managing Petersburg Building and Supply. The business reached its 40th anniversary in 2016. The services include helping customers plan their building projects in advance, and following up with advice during and after a project. Monty helps customers with their plan and building needs. Teri assists with paint colors and decor, and also handles bookkeeping for the business. See complete feature in the May 3 Petersburg Press, Print and E-Editions.